Enjoy incredible sweeping views of Lake Superior from a premiere bluff located near Cove Point Lodge. Windsong 610 is a Lake Superior townhome located near Cove Point Lodge in Beaver Bay, MN The open living area features a living room with a gas fireplace and a Smart TV with DVD and Cable. The comfortable living room furniture is great for relaxing and watching a movie on a rainy/snowy day. Enjoy incredible views from your private deck, complete with a gas grill for summertime BBQs. The living room is open to the kitchen and dining room area. The modern kitchen features granite countertops. Enjoy this galley style kitchen for preparing a meal during your stay. The kitchen is well-equipped with pots, pans, and dishes. This kitchen also features a dishwasher. There is seating for four at the dining room table, or pull up some of the seats from the kitchen and seat up to 6 at the table. Never miss a moment with friends and family in this open living area. Windsong 610 is a two-story home with the kitchen, living room, dining room, a full bathroom, and a guest bedroom on the main level, and a master and guest bedroom on the upper level. The master bedroom, located on the upper level, boasts a king sized bed, in-room jetted tub, TV with cable and DVD, and incredible Lake Superior views. You will love the 4-post king sized bed in the master bedroom. Relax in the in-room jetted tub that allows you to lay back and enjoy the Lake Superior views after a long day of exploring the North Shore. The master bedroom has an attached bathroom. The spacious vanity is the perfect place to get ready in the morning before your day`s adventures. The second part of the master bathroom has the toilet and a walk-in shower. The first guest bedroom, also located on the upper level, has a queen bed and attached full bathroom. This spacious room is great for getting a good night`s sleep. The attached bathroom has a shower/tub combo. The second guest bedroom, located on the main level, has a queen bed. The second guest bedroom is located near the entry to the townhouse. Located on the main level, the main guest bathroom has a walk-in shower. Consider Windsong 610, a lakeside townhome center unit pictured here for your next North Shore vacation. Take a hike down to the shared shoreline area. The pathway to the shoreline may be a bit tricky with loose rocks, please walk carefully. The shoreline is a great place to enjoy the Lake Superior views. Looking up towards the town of Beaver Bay. Looking down towards Cove Point Lodge. One of the great community features available to you as a guest of Windsong 610 is this indoor pool area- open Memorial Day weekend through New Year`s. There is also a sauna in the pool house area that you can enjoy- open all year long. Outside of the pool house you will find a community BBQ area with two charcoal grills and picnic tables. Near the BBQ area is the community fire pit, great for getting to know your fellow travelers. 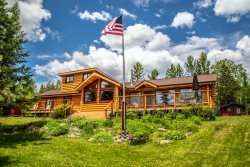 Located adjacent to Cove Point Lodge, Windsong 610 is a warm and inviting vacation rental townhome in Beaver Bay, MN,, positioned on a bluff overlooking Lake Superior. This home features Lake Superior views from the living room and master bedroom. Since you are on a bluff so close to the shoreline it almost feels like you're floating on the water. Here you can enjoy the many amenities offered at Cove Point Lodge- including an indoor swimming pool (seasonal) and sauna. Windsong 610 is a 2-story, 3-bedroom, 3-bathroom townhome located on a bluff overlooking Lake Superior. Shared lake access is just a short walk away, as is the community area featuring the indoor pool and sauna, as well as a BBQ area and fire pit. There is also a restaurant and bar within easy walking distance. The home and community have everything you want in a modern vacation townhome. The kitchen features granite countertops and a dishwasher, while the master bedroom features an in-room jetted tub. You will love the heated floors in the bathrooms. Beaver Bay is located along Lake Superior's North Shore in Lake County, about 30 minutes from Two Harbors and an hour from Duluth. The area features plenty to do for the outdoor lover- miles of hiking, biking, and cross-country ski trails are practically in your backyard! Split Rock Lighthouse and State Park is just a 5-minute drive back down the shore. Head just a few miles up the shore and you'll hit Palisade Head and Tettegouche State Park where you can take a hike out to Shovel Point or to a scenic waterfall. The town of Beaver Bay features some lovely restaurants and gift shops. Be sure to check out the Agate Shop! The home is near snowmobile trails with easy access for enjoying a day on your sled. No matter the season, there's plenty to do on Lake Superior's North Shore, including fishing, biking, cross-country skiing, snowmobiling, or simply relaxing on your deck and watching the ships on the Lake. Calling Windsong 610 "home" during your time on the North Shore gives you access to all of this and more!